Dependency Injection (DI) is one of those “new” concepts that keeps showing up in every blog post on the Internet. In fact, the idea is not new, but a notion that gets revisited from time to time. Mastering DI will allow you to handle large and complex applications in a more convenient way. In this tutorial, you’ll get to know Koin, one of the most popular new frameworks for DI. You’ll start by learning the basics of DI and how your Android projects can take advantage of it. You’ll then apply it to a sample app that adopts Koin as a DI framework and illustrates its benefits. 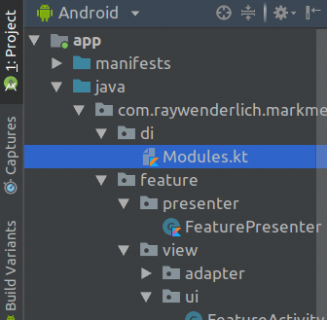 Believe it or not, many Android developers have been using DI since their very first applications. However, most new developers haven’t used any DI framework, such as Dagger 2, on their first projects. This sounds ridiculous, but it’s true. How? Follows a recap of the basics of DI. In the illustration above, ClassA uses an object instantiated, or created, by itself, whereas ClassB just employs an object instance, regardless of where it comes from. So, it can be stated that DI means that a specific entity or class instance can obtain any dependency it needs from the outer world. In other words, the class is not concerned how it gets a dependency — just how to use it. Pass dependencies through the object constructor. Using one or the other depends on the developer, who should based his decision according to the size and complexity of the application. For more information about DI, check out this helpful resource. To DI or Not to DI? Single Responsibility Principle states that every class or module in a program is responsible for just a single piece of that program’s functionality. Dependency Inversion states that high level modules should not depend on low level modules; both should depend on abstractions. DI supports these goals by decoupling the creation and the usage of an object. Thus, it allows you to replace dependencies without changing the class that uses them and also reduces the risk of modifying a class because one of its dependencies changed. This makes DI a great option when an application is expected to grow considerably in size and/or complexity. So, why use Koin rather than one of the other DI frameworks? The answer: Koin is more concise and straightforward than the others. Take the popular Dagger 2 as an example. To use Dagger 2, you first need to become familiar with concepts like module and component and annotations such as @Inject. While the steep learning curve for this framework eventually pays off, to get the most out of it, you still have to learn some advanced concepts such as scope and subcomponents. In contrast, Koin allows you to simply declare modules, which include potential dependencies, to be used in the project and directly inject them in the class of interest. Declare a module: Defines those entities which will be injected at some point in the app. Start Koin: A single line, startKoin(this, listOf(applicationModule)), allows you to launch the DI process and indicate which modules will be available when needed, in this case, only applicationModule. In consonance with Kotlin features, Koin allows to perform lazy injections in a very convenient way. One limitation when using Koin is that you can only inject dependencies in Activity classes out of the box. In order to inject dependencies in other class types, you must do it through the corresponding constructors. To solve this problem, Koin allows classes to conform to the KoinComponent interface, so that injections are possible on non-Activity classes. You will see an example of this later on. Now that the theory is clear, time to get to the action! From this section on, you’ll create an application named Mark me!. You’ll see how an application can include DI while following a proper architecture that advocates for the separation of concerns. You’ll use the popular model-view-presenter (MVP) as the architectural pattern in the presentation layer. Begin by downloading the starter project using the Download Materials button at the top or bottom of the tutorial. The starter project contains the basic skeleton app and some assets. The code is organized by functional modules, specifically splash, main and feature. Moreover, the application includes auxiliary packages such as di, for DI, repository, including database feature, model and utils. Build and run the starter project. As you can see, the application looks finished. However, before it can function, you still need to add all of the logic. If you tap on either the Attendance or Grading buttons, the application will report a crash due to the lack of implementation of certain functionalities. TODO("not implemented") //To change body of created functions use File | Settings | File Templates. This will cause a crash until this snippet gets replaced with a proper method implementation. In this section, you’ll incorporate Koin as the DI framework for the application skeleton provided in the starter project. Mark me! is an app designed for teachers. It allows a teacher to register the attendance and grading for a class. SplashActivity includes the MAIN intent-filter. MainActivity allows the user to navigate to two features, Attendance and Grading. FeatureActivity actually implements the mentioned features. The app skeleton includes the Student class defined in the Data.kt file in the model package. The project also contains a pair of adapters in the feature package. These implementations do not directly relate to the topic of this tutorial, but feel free to have a look at them and analyze their behavior. Take some time to inspect the rest of the starter project and all the features included out-of-the-box, such as the resource files strings.xml, dimens.xml and styles.xml. Now, sync your project and you’ll be ready to start using Koin. Once you’ve added Koin to the project, you can start defining the dependencies that will be injected in your code when required. If you review the project, you’ll see that, to finish Mark me!, you need to indicate whether the information will save in a database or the user preferences. Create a package di and a new file Modules.kt where you’ll define the entities to be provided. Then, add the following snippet, taking care to import what the IDE suggests in each case. The module is marked as override, which means that its content will override any other definition within the application. A factory is a definition that will give you a new instance each time you ask for this object type. In other words, it represents a normal object. Any presenter involved in the application will be injected in the view instance in this way. single depicts a singleton component such as an instance that is unique across the application. This is typically intended for repositories, databases, etc. Note: Koin single and factory object declarations allow you to include a type in angle brackets and a lambda expression, which defines the way the object will be constructed. Due to SOLID principles, the indicated type is usually an interface that the object to inject has to implement. This makes this object easily exchangeable in the future. For example, in the first case the SplashPresenter needs to implement the SplashContract.Presenter and will use a SplashContract.View object as an argument constructor. As previously stated, DI helps make code easier to reuse and test. Taking into account that you are using an MVP architecture implementation, the aim is to make any presenter in the app as decoupled as possible. In other words, presenters will receive but not instantiate other classes. Start by modifying how the SplashActivity instantiates the presenter. Now, splashPresenter gets lazily injected when needed. The expression parametersOf() is part of the Koin library and allows you to indicate input arguments for the object constructor. If you recall in the Modules.kt file, you defined a factory to return a new SplashContract.Presenter when a SplashContract.View is given. In this case, the SplashActivity is the SplashContract.View and is passed into the factory through parametersOf(). This tells the presenter to load any persistent data available. If you happen to run the project right now, you will get a crash on this precise line since loadPersistedData doesn’t have implementation yet. Don’t worry, you’re going to fix this. When the user stores any data, a message will appear thanks to showToastMessage. You’ll use onPersistedDataLoaded to publish the fetched data in a list. Obviously, you still need to define updateData. As you can see, the implementations are pretty similar but not exactly the same. In the first implementation, the changes to the attendance list are individually notified to the adapter, while in the second implementation, the whole grading list is changed as a group at the end of the loop. The only reason for this difference is to show you two possible approaches. Don’t forget to turn the class into a KoinComponent. Recall that Koin cannot inject non-Activity objects out of the box. In this case, since FeaturePresenter is not an instance of Activity, you must add the KoinComponent interface to the class. Again, don’t be upset if you run your code now and you get a crash since you haven’t provided any definition for fetchFromDb yet. Last, you’ll work on the repository module — specifically, the singleton class AppRepository. When you open it up, you will see a few TODOs to get rid off. Time to tackle them! private const val MSG_DATA_SAVED_TO_DB = "Data saved to DB"
private const val MSG_DATA_SAVED_TO_PREFS = "Data saved to prefs"
Once you add the above snippet, you’ll get an unresolved reference error because database was never injected into AppRepository. This entity refers to the Room implementation set up in the project. This entity was also defined within the app dependencies. Add the next line right after the class header and make sure it implements the KoinComponent interface. The method asynchronously inserts a list in the database and notifies it through a message in a lambda callback. The last two methods implement fetching data from the database and the preferences, respectively. The only difference between the two methods above is that the database queries are performed in a worker thread, not the main one. And with that, you have finished implementing Mark me! Congratulations! When started, the splash screen appears for just a few seconds, and then it jumps directly to MainActivity. From this screen the user can navigate to either of the available features: Attendance or Grading. Both of them provide a list that shows certain information about a class of students. You can gracefully scroll along these lists and check/uncheck in one or several student registers. Tapping on the corresponding buttons saves the selections. The navigation is handled by the Toolbar and Back Arrow events. To properly asses a DI framework, you need to know how well it behaves when it comes to a unit test. Good news! Koin perfectly addresses this need. The first library brings in Koin DSL, version 1.0.2 in this case, for testing, whereas the second adds extra features to Mockito so it can work with Kotlin. Note: If you’ve never heard of Mockito, it’s a mocking framework for unit tests in Java. 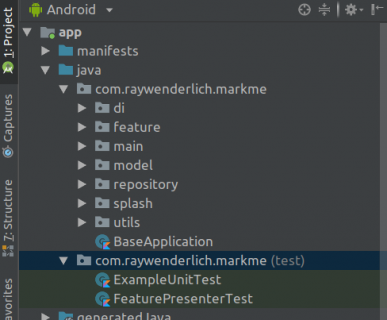 If you’re interested in adding Mockito to your project, you can read about Android Unit Testing with Mockito on our site. Generally speaking, unit tests make sense on non-Android layers since you want to check your logic, but not the framework itself. Since this project uses MVP as the architecture pattern, presenters should be the target. In this example, you’re only going to check that a method is called when a certain condition happens, which will prove the compatibility and convenience of using Koin for testing. According to the above, create a file FeaturePresenterTest.kt in the test folder. The class must implement the KoinTest interface. All the elements used must be instantiated or injected, even if you are not using them directly, like the view. Since the Android OS does not allow you to invoke Activity objects, the view has to be directly mocked. Koin needs to start normally so that injections take place, including all of the dependency modules. All objects not being tested have to be mocked. In Koin, you can use declareMock for those injected objects. It’s good practice to use descriptive names for your methods. Remember that you can use `` to enclose a name with whitespaces. argumentCaptor allows you to grab a value or variable and use it later with any Mockito expression. This is required when using Koin. Since you’re checking the presenter, invoke one of its methods with the appropriate arguments. This line is where the evaluation actually happens. In this case, you verify that the add2Db method from the repository gets called. If you remember the FeaturePresenter class, this should be the case when invoking onSave2DbClick. The eq method is also mandatory due to limitations between Kotlin and Mockito. Always remember to stop Koin. Run the test and make sure everything passes! You can download the fully finished sample project using the Download Materials button at the top or bottom of the tutorial. While there are several good references about DI, and Koin in particular, the best source may be the official documentation, which is rather concise and self-explanatory. Articles like this one make starting to work with Koin much easier. This article is a more practical example, which may help you on your first attempts. If you want to keep working with the sample app you’ve just finished, try replacing the presentation layer architecture with MVVM. 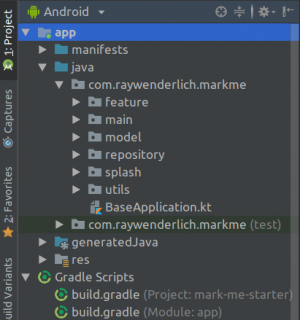 This pattern is becoming very popular in the field, especially after the Google I/O 2017 conference, where it was incorporated into the Android Architecture Components (AAC). Koin includes a specific DSL classes to handle this new ViewModel stuff. I hope you enjoyed this tutorial about Koin. If you have any questions or comments, please join the forum discussion below!